Lipo 6 is a range of fat burner products manufactured by Nutrex. Lipo 6 products have been quite popular, especially among workout enthusiasts and athletes. Lipo 6 is preferred by many because they are effective for weight-loss purposes. However, there are several different products of Lipo 6, such as the two most popular items on the market right now, Lipo 6 RX and Lipo 6 Black. 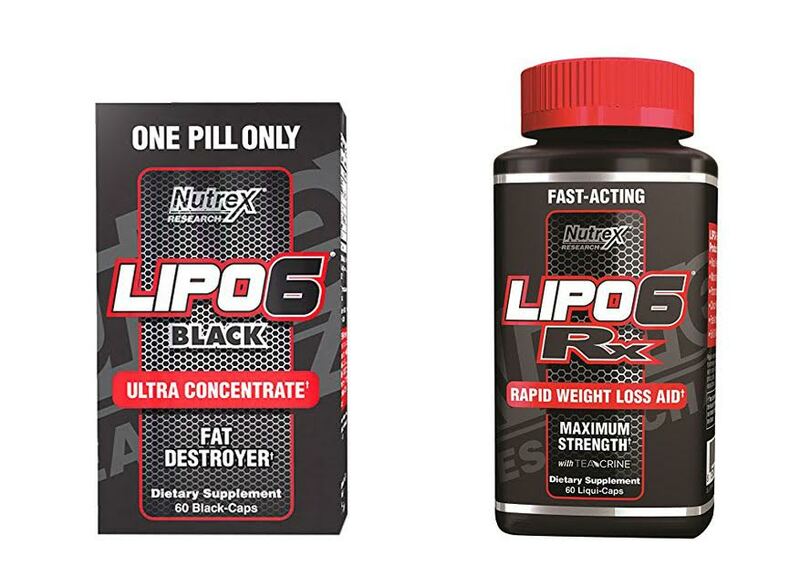 Hence, the question is, what is actually the difference between Lipo 6 RX and Lipo 6 Black? Read the comparison below to find out which one is the most suitable option for you! For sure, these two products have different levels of intensity. Lipo 6 RX itself is already considered as a powerful weight loss supplement. It is labeled with “fast acting” and “rapid weight loss aid”, meaning that it has been designed to help you lose weight and fat quickly. Still, it takes some time to achieve the full result. It is ideal if you still have some time to reach the desired weight. However, Lipo 6 Black is an even more powerful weight loss supplement than Lipo 6 RX. Lipo 6 Black is an extremely powerful fat destroyer. It is very strong that the manufacturer puts a bold caution that the consumer should only take one pill. The ultra-strong formula rapidly destroys body fat deposits and lowers your body weight in just a few days. It can be the choice for an athlete who only has a few days to reach a certain weight in order to meet the requisites of a match. The main ingredient behind Lipo 6 RX is Teacrine, a substance that has similar effects to caffeine but without the habituating effects. Still, caffeine is generally more potent in reducing weight, and Lipo 6 RX still has some caffeine along with ginger root extract and yohimbine to enhance the effect. Still, even though Lipo 6 RX does not have the strict “one pill” limitation, you should not take consume it too much. The caffeine content may cause sleep difficulty and irritability, so you should not take it within six hours before sleep. On the other hand, Lipo 6 Black uses Advantra Z, Yohimbine, and Caffeine Anhydrous. These ingredients are indeed more potent for weight loss. Due to the higher caffeine content, the side effects can be somewhat more salient, too. If you have a short deadline to reach a particular body weight, Lipo 6 Black is your better bet. Keep in mind that you should not take more than one pill of it at a time. Meanwhile, if you don’t have a specific deadline to lose some weight, you should choose Lipo 6 RX instead, which doesn’t push your body too hard.